I'm finding it rather hard to imagine a perfect Sunday right now. This is because today has been a rather imperfect Sunday, with the majority of it being spent on a stuffy National Express coach travelling from Leeds back down to London. I arrived home, only to find that the bunker in which the computer resides is experiencing below-zero temperatures, because someone who shall go unnamed forgot to leave the heating on. Honestly, you lot will never know just how much we suffer for our art. The good news is that I'm made of pretty stern stuff, yeah, that's right, I'm no quitter. So whereas some might choose to run back upstairs, and leap under a blanket with a water-bottle and a nice cup of cocoa, I'm going to ignore the frostbite slowly seeping into my fingers and write...write like my life depends on it! F*ck yeah! A prefect Sunday in London would begin with waking up not at home, but in a hotel, because hotels are cool. My favourite hotel in London that I have stayed in so far is The Zetter. My beloved and I would have a hot drink, read the papers and then get dressed. We would leave the hotel and head east, to Spitalfields Market , where we would have a lovely cooked breakfast at the S & M Cafe on Brushfield St. After belching copiously for a little while we would hail a black cab ("HAIL CAB!") and ask to be taken to 'The Heart of London' (my friend Phil and I used to frequent a Pizza Hut where Shaftesbury Avenue and Charing Cross Road intersect and for some time there was a sign outside which proclaimed 'Welcome to the Heart of London'). Here we would shop. In particular we would visit Fopp and Sportspages (but only if I've been good) before heading to Oxford Street or Covent Garden for more beloved-friendly shops (such as H&M or Zara or maybe the Molton Brown shop where you can buy expensive smelly stuff that females like). Then we would walk to the Curzon Cinema in Soho and watch a film that would make us both happy and sad. After that we would be hungry again (unless we'd eaten too many snacks at the cinema), so we would perhaps pop into Hamburger Union or Ed's Cafe . After that we would be feeling fat and in need of a walk, so we would get one of those rickshaws to take us all the way to Victoria Park (myself and another friend, not Phil incidentally, actually did this one night in 1997 after my 21st birthday celebrations....all the drunks on the Whitechapel Road waved at us and our rider claimed that his name was Maverick). 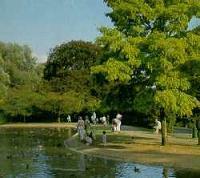 We would then walk around the park and look at the squirrels and the lake and the bandstand and the fat people swearing whilst playing football. After that it would be time for a drink, so we would go to the Royal Inn on the Park and all our mates would be there and they would shout 'Hello!' and buy us drinks and give us hugs. After lots of drinks we would go for a curry in Brick Lane and then pay too much for a minicab to take us home and then go to bed and then wake up the next morning hungover and think 'oh my god I have to go to work'. Hmmm.....probably not my best piece but there you have it. Right, time for that cup of cocoa. Ta ra.